I've haven't written too much here lately. This is because I have spent most of my emacs hacking time on mu4e, an emacs e-mail client. It's only slightly over six months old since its first release, but it has progressed rather quickly! So, I think it is time to give it an introduction to a wider audience. In future posts, I'll go into more detail. 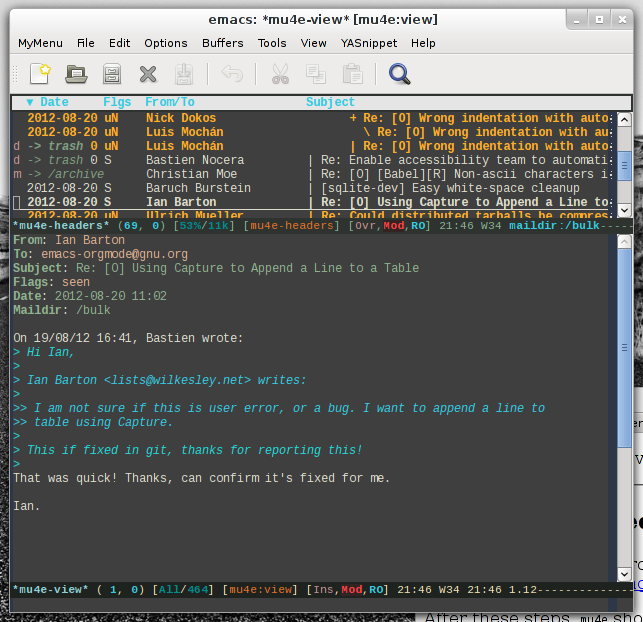 E-mail is a very important means of communication for me; and for purposes of integration, it prefer to do my e-mail with emacs. For a long time, I used mutt with emacs as the editor; a few years back I switched to Wanderlust, and wrote a few articles about it. There's a lot to like about Wanderlust: it's very featureful, and allows for a lot of customization. Still, there were a few things I was not fully happy with; the most important one was the speed of some operations; another annoyance was the fact that I got rather frequent cache-corruptions when using newer emacs versions. So, what was I to do? Well, a few years back, I had written an e-mail indexer/searcher, called mu. 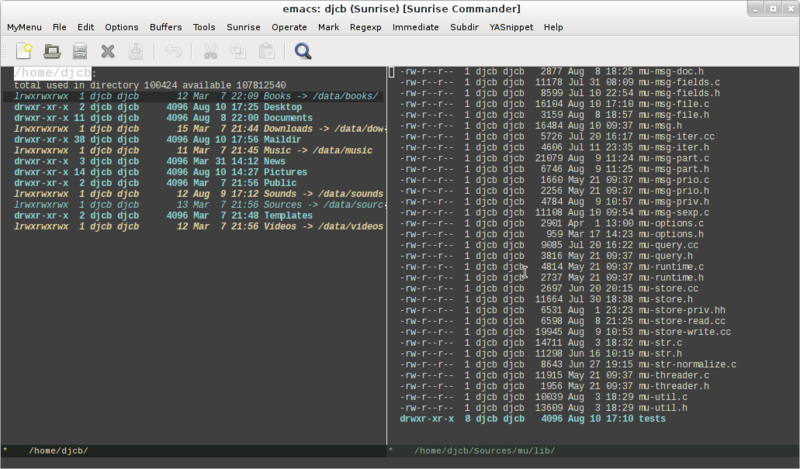 It takes the messages in a maildir-folder, and allows you to query them. I wondered if I could use mu as the backend for an emacs-based e-mail client. So, I fired up emacs, started writing some code and some later I had a first version of… mu4e. 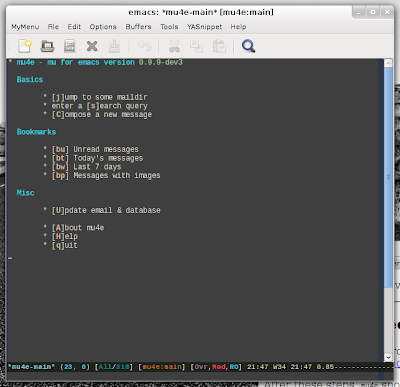 mu4e is an emacs front-end for mu; when you start it, mu4e connects to a mu server process (started on-demand). 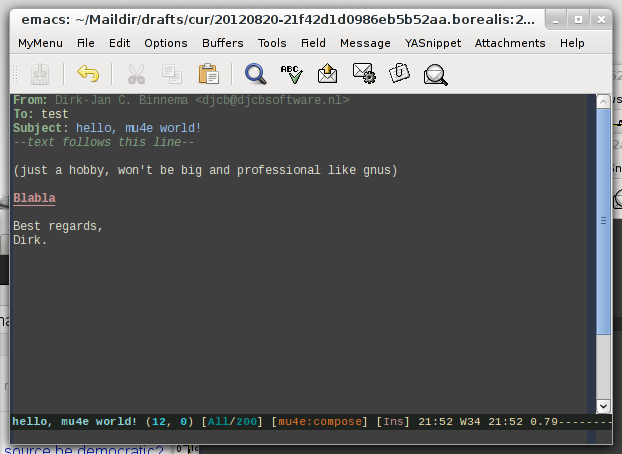 It accepts simple commands, and responds with emacs s-expressions, in asynchronous fashion. In practice, all the heavy work is done in this server process, and emacs shows the results when it is ready (usually almost instantly). Emacs does not need to wait for the backend, and things stay snappy, even with tens of thousands (or more) e-mail messages. The only operation that may still require some waiting is sending mail, since that uses the emacs built-in smtpmail, which blocks during its operation. mu expects your e-mail messages to be stored in a maildir (a one-file-per-message system); you can get these mails there through tools like offlineimap or fetchmail. mu periodically indexes the messages, and stores the results in a Xapian database. A lot of what mu4e does is querying this database – so for example, what you see as 'my inbox folder' in the mu4e-frontend, is in fact just the result of a query of all message that happen to live in that folder. You can query for many things – message sender, subject, date, words in the body and more. mu4e does not just query messages; it can also move messages between folders, delete them, modify their flags and so on (and afterwards update the database). All 'state' is in the file system, and the database is just a quick way to get to it; if you delete the database and then re-index, nothing is lost, and changes made with other tools (e.g. mutt) are picked up by mu as well. Some Linux distributions ship mu4e, but not necessarily a very recent version; and because mu4e is developing quickly, you may want to use the latest official release, or (if you are more adventurous) check out the git repository. You'll need GNU/Emacs 23 or 24, GLib, GMime >= 2.4 and Xapian. After installing mu4e, you can check the mu4e manual, which should be fairly complete. In fact, one of the goals of mu4e is to make it easy to set up; for that reason, the documentation includes complete examples of how to set things up. The Getting started chapter should get you up to speed quickly. So, give it a try if you're interested; the mu=/=mu4e project is very open to suggestions (and even bugs reports! ), so feel free to put them here or subscribe to the mu mailing list. I'll end this with a number of screenshots, to give you a rough idea of how things look. When you start mu4e (M-x mu4e), you're taken to the main screen, which list the things you can do. The entries should speak for themselves. Note that you can define you're own bookmarks. In general, mu4e tries to make things as easy as possible, and provide auto-completions where possible. The results of your queries are shown as a list of headers; if you click one of the headers, mu4e splits the screen horizontally (optionally, you can split the screen vertically, or only show the message view). You can customize the headers shown, re-order them and so on. The message view supports html message, inline images, and has a mechanism to associate user-functions with messages and attachments (such as 'view in browser' or 'pipe through command'); see the manual for some examples. Obviously, you can reply to messages, forward them, or compose a new message. 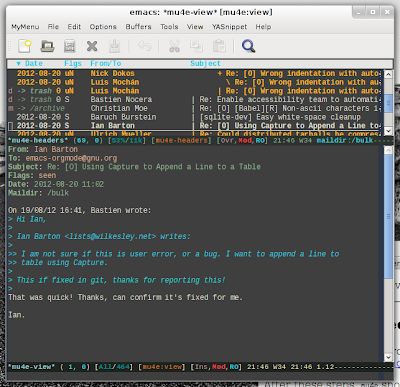 For writing and sending messages, mu4e reuses emacs' built-in message-mode. There's support for auto-completing addresses (based on the e-mails you've sent/received before). There's even (experimental) support for writing you're messages using org-mode, and then sending them as rich-text (html) messages. So, this was a short introduction to mu4e, barely scratching the surface, but hopefully conveying the main ideas. The manual discusses things in much more detail, and I'll write more about it in the future. mu4e is still a young project, but, for what's it worth, I've been using it full-time for over six months, and a growing number of people are doing the same. So, if you're interested, give it try and let us know you think! 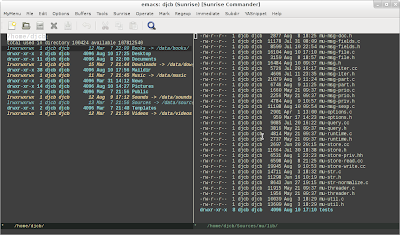 I tend to do a lot of file management from the shell (zsh, in my case); this is very flexible / powerful and so on. But, for some things a bit more graphical approach is nicer. There are fully graphical file-managers like Nautilus or Thunar, but for a bit more keyboard-friendly file-management, there are so-called orthodox file managers - the archetypical Norton Commander and its descendants, like midnight-commander (mc) and gnome commander. Not surprisingly, emacs has its own incarnation - it is called the sunrise commander and happily it's obtainable through ELPA. It's become an important of my workflow. When you're used to Midnight Commander, you'll feel right at home. If you want to use emacs for yet another of your computer-based activities, give it a try.